Pours a musky red colour, ochre decent film of head when poured, but now just a thin rim. Sticks to the glass OK. Yeah, OK. Smells tart, and very phenolic. Touch of berry in there, with some medicinal notes, dark cherry and an oddly sweet molasses character. Bit weird. Taste is very sweet-seeming, quite heavy. Malty caramel notes upfront, then some dark molasses and nectar notes before phenolic and boozey finish. Tastes a lot like ethyl alcohol from simple sugar fermentation. Heavy, boozey, without the warmth or body to back it up. Feel is bland, fluid. Not sure what's intended here, but it's simple and mostly unpleasantly boozey. Lacking complexity and balance. 22oz bomber purchased from K&L Wine Merchants in Redwood City, CA. Brought back to Sydney and shared with Sam and Rich. Pours a slightly hazed, but pleasant deep orange amber, without a great deal of carbonation, and without much propagation of head, even when poured vigorously. Body looks pretty fluid, but what carbonation it has hides in a fine mesh when tilted, making it seem a bit thicker than it is. Looks decent enough. Nose is quite spicy, and perhaps a bit woody: certainly with a little Old Ale-style oxidation to it. Some nutmeg and brown sugar, a touch of something a little sharper, perhaps cinnamon or allspice, even maybe a suggestion of dried ginger. It's interesting. Taste is similar, but with a true lack of sweetness. This means that while there's more of that nutmeg and cinnamon richness on the front, the back just drops off, leaving the spices sitting exposed and astringent. It also makes it feel slightly solvent-y on the back: certainly sharper and weaker than it should be. Feels very dry on the finish, leaving nothing in the feel except a bit of heat and that prickle from the spices. Overall, it's not bad, and there are certainly interesting things to it. But it doesn't work as a whole, and feels a bit harsh on the back. Not something I'd want to drink a lot of, but something I'm glad I experienced it once. A - Hazy amber-orange with a finger of frothy tan-khaki head. Fades normal. S - Sweet caramel and bready malts, banana, clove, ginger, nutmeg, cinnamon, some citrus zest. T - Sweet caramel and bready malts, English yeast character, clove, banana, ginger, nutmeg, cinnamon, brown sugar, some citrus zest. M - Medium bodied with moderate carbonation. Smooth with a sweet and warming finish. D - Nice winter warmer mixed with old ale. Good overall balance. Smell- Ginger graham cracker, slightly medicinal/clovey but not off putting. whole wheat bread. nutty maybe some butterscotch. Taste- not as spicy as i imagined. carmel hints of gingerbread. mildly fruity some clove. Seems a little lacking in malty sweetness for an old ale. It seems almost belgian in the fruity department. It said it was made with molasses but i didn't taste that. Mouthfeel- Incredible smoothness for something this strong in ABV. slightly dry finish with subtle alcohol warmth (this could sneak up on you at that holiday party). Overall- seems a little fruity and lighter for an old ale. It lacks a malty robust characteristic that I kind of associate with that style. Its not particularly "spicy" either. But I would order another one of these, infact I would love to taste it as an actual old ale (as in aging it a year or more). See what happens to that alcohol. heck throw it on some Oak! In its defense i could see it tasting really good with pumpkin pie, gingerbread or molasses cookies, even a slice of fruit cake. You know those tasty holiday desserts! Tasty brew for sure ! Handsome brownish amber in the St. Bernardus chalice. Really nice foam erupts as you slosh the glass, which means a pleasant sudsiness in the mouth. This has all the character of a good holiday season beer-- buttery, nutty, and lots of fruit. While very malty there is just a little sweetness. The richness comes from so many flavors and that dry butterscotch undertone. They don't say what goes into this "Spiced Old Ale" but it has some slight cinnamon and clove flavors without overdoing the spice. A bitter edge to the aftertaste but no real hoppy aromatics. Dry raisiny finish. Highly sippable. One of the better examples of the Old Ale style to my taste. I would argue that this is not a "Winter Warmer." From the 22 oz bottle bought at Best Damn in San Diego. Label says 8.1% ABV. 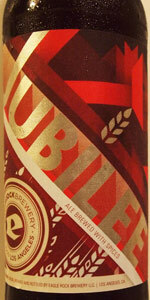 I've had Jubilee last year on draught but this is the first time in bottle. Whether it is better in bottle or this is just incredibly fresh - I like this beer quite a bit more. There's a great gingerbread finish to it. Nice seasonal for this mild December day in Los Angeles. A: Pours a clear light brown with a light fizzy tan head. Good retention. S: Lots of sweet winter malt, toffee, hint of of spice, cinnamon notes. T: Kind of a lighter Old Jubilation for me. Good malt flavour, notes of raisins and Christmas cookies. M: Medium-bodied, smooth with a light ethanol touch which is quite nice. O: A really good winter beer. Still haven't had a lot from Eagle Rock, but I've liked what I had so far.